I was wondering since the new Notes are in the Clearcontext database - will it sync somehow if I use clearcontext on multiple computers - so I have access to the notes on every computer? Yes, notes will sync between computers when using Exchange. Any news so far? Kindly advise when we can start with beta testing? what is estimated release date of 5.1? Sorry for the not-so-prompt response here, we've been super focused here on getting internal release testing finished. We're still planning on May beta and June release, so stay tuned for some final details on that next week! Oops, looks like I let things get a little out of control. No worries, though, I just head over to the new ClearContext Task Organizer and quickly update due dates - of multiple tasks at once! 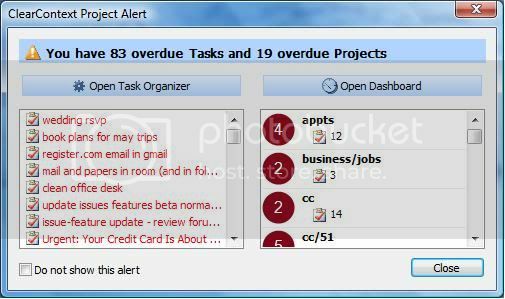 I can also quickly see which tasks don't have due dates, projects, or categories assigned and set those as appropriate. In just a minute of review, I'm back on top of what I need to do and when! We hope this gives you a good idea of what 5.1 is all about and how we're making it easy to keep your tasks and projects organized along with your email and inbox! We can't wait to have you try it out! will all project info sync between multiple computers? Project info is synchronized between computers. 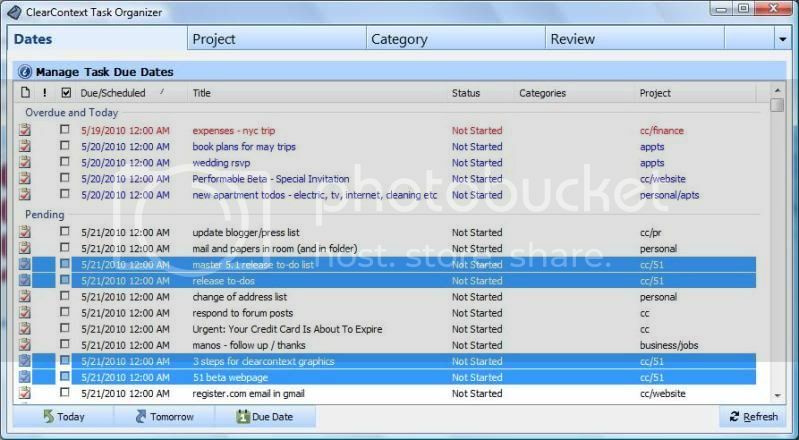 Would you please explain how to sync the project info between computers? Thanks! Assuming you are on Exchange and have CC installed on both PCs, the information is automatically synchronized behind the scenes. What if exchange is not an option? Is there a folder which contains the data which can be synced between computers? If the entire mail file is copied, the information will be copied over. However, if the synchronization program you are using only copies select folders, the CC data required will not be synchronized. Do you plan to support Office 2010 64bit in 5.1? The initial v5.1 release will not have Office x64 support. Is there a plan and a date for 64 bit support?